Home » Metal Polishing Supplies » Bristle & Wire Brushes » Miniature Wire Brushes » Artco Wire Wheel Brush 1-1/4'' dia. 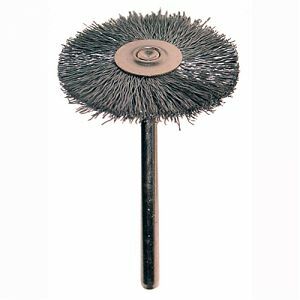 Artco Wire Wheel Brush 1-1/4'' dia. These precision miniature wire brushes are ideal for cleaning, light deburring, polishing, and producing special finishes. Use brass wire for yellow metals such as copper, beryllium and brass, or steel wire for white metals such as steel and aluminum. Available in .005" thick wire only.